Has the commemoration of International Women’s Day also now been outlawed in China? The Chinese dictatorship celebrated International Women’s Day by arresting women activists, a move that has caused outrage around the world. The arrests highlight the widening repression under Xi Jinping –China’s ‘paramount leader’ – and also how women’s rights are being stifled in China today. 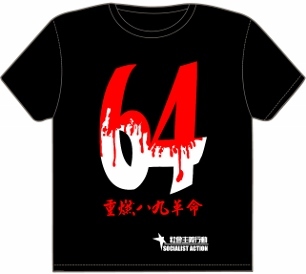 On 6 and 7 March, just before International Women’s Day (8 March) and just as the annual ‘red carpet meeting’ of the NPC (National People’s Congress) was getting underway in Beijing, security forces arrested at least ten women activists for preparing protests to highlight gender oppression. 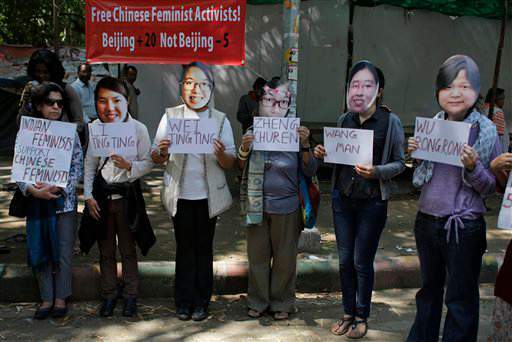 Protest in India to demand the release of the China 5. This was a trans-provincial action by the Chinese police. Activists were arrested in different places – in Beijing, Hangzhou and Guangzhou. Some of the activists have been released, but five well-known feminist activists are still being detained. Their names are: Wu Rongrong (武嵘嵘) age 30, Zheng Churan (郑楚然) aka Da Tu (大兔) 26, Li Tingting (李婷婷) aka Li Maizi (李麦子) 26, Wang Man (王曼) 32, and Wei Tingting (韦婷婷) 26. Li Tingting was arrested in Beijing, Zheng Churan was arrested in Guangzhou, and Wu Rongrong in Hangzhou. The women planned to organise protests in different cities on 8 March, International Women’s Day, to march in a park in Beijing city, and go on public transport with stickers to spread the message against sexual harassment. In recent years these activists have become well known with their “performance art” to arouse public awareness on women’s rights in China. This includes the ‘Occupy men’s toilets’ campaign to demand increased women’s toilet facilities in public places, and also an action wearing white wedding dresses daubed with red paint as a protest against domestic violence. They are members of the Women’s Rights Action Group, which campaigns against gender discrimination. As Time magazine points out, the five activists “were not advocating for the overthrow of the Communist Party.” Nor did they “organize political rallies, but rather used performance art to challenge societal views.” [Time magazine, 19 March 2015]. Once again, as with crackdowns against anti-corruption whistle-blowers and campaigners for ethnic minority rights, Xi’s ultra-repressive machine has struck even against moderate within-the-system critics. On 12 March, the five were reportedly officially charged by police with “creating a disturbance, picking quarrels and provoking troubles”. This is a catch-all charge widely used by the dictatorship to silence and incarcerate regime critics – including workers’ representatives and ‘political reform’ activists. A guilty verdict can carry a sentence of up to five years in prison. The five can now be held in detention for 37 days before the authorities decide whether to press ahead with formal charges. Since the five women activists were arrested there have been petition activities around China to call for their release, but in many schools and universities these actions have been stopped by the authorities with school officials threatening reprisals against students. Related websites and social media platforms have been blocked in China. International solidarity action is needed urgently. The CWI (Committee for a Workers’ International) which has an exemplary record of campaigning against sexism and discrimination, as well as against state repression, can play a key role in initiating protests given its extensive global connections and active organisations in more than 40 countries. 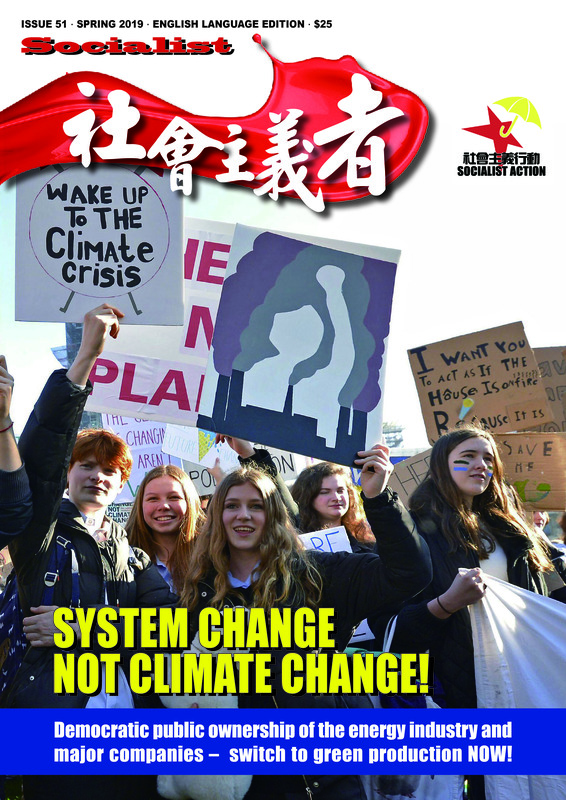 The Chinese supporters of the CWI, in China and Hong Kong (Socialist Action), are appealing to socialists and women’s activists internationally to organise protests, by writing to the Chinese authorities and staging demonstrations demanding the release of the ‘China 5’.